Did you SEE that game yesterday? Oh wait. You don't know what I am talking about? The World Cup. I know, here in America it really isn't that big of a deal, but in our half-Brazilian / half-American household it is more than just a soccer tournament; it is pretty much what 95% of our conversation is centered around these days. And I love it! I haven't always cared about it. In fact, I never had even heard of the World Cup until I was graduating college and a group of my friends didn't come to the graduation because there was a game on. Actually, they came. They just stayed in the back, all crowded around a pickup truck with a TV connected to it, cheering for whatever teams were playing at that moment. Technically they were there, but there weren't really there. I was fuming! These were some of my best friends, they showed up for my college graduation and didn't see me get my degree because of a soccer game?! This household cheers for Brazil. All the way. I mean, my husband comes from a country where every time they play is equivalent to a national holiday. Schools are closed, businesses are shut down, and parties are going on everywhere. Imagine the 4th of July -- continuing on throughout a month. This is a big deal for him, and has become a big deal for me. But yesterday we cheered for the USA (Go, Team, go!). DID YOU SEE THAT GAME?! I think my heart sank at minute five, and then soared from about the middle of the game on... until it almost stopped beating during the last 30 seconds. If you don't know what I am talking about you really should check it out. Man oh man, it was intense. But at the end of the day -- win, lose, or draw -- life goes on. And I don't know about you, but I work up quite an appetite while watching these boys battle it out on the pitch. To help combat that, I bring you a chicken enchilada casserole. 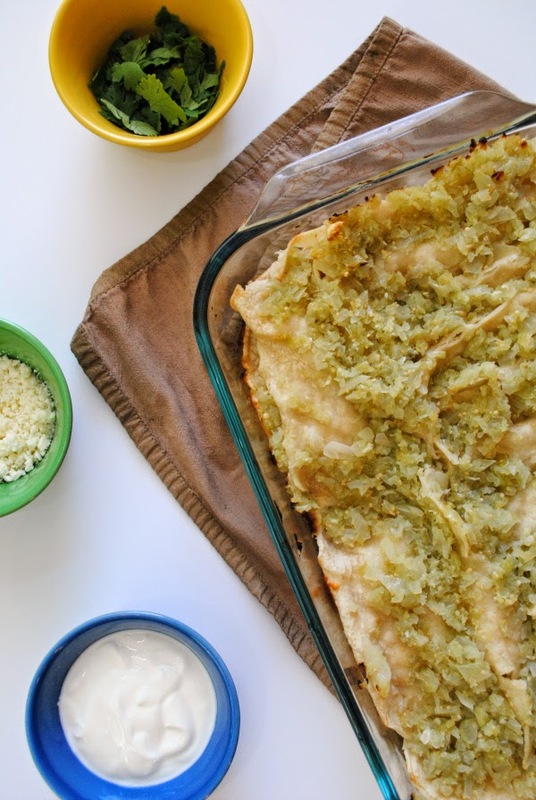 The beauty of this casserole is that you don't have to really roll the enchiladas. Just stuff them, fold them in half, and layer them in the casserole dish. 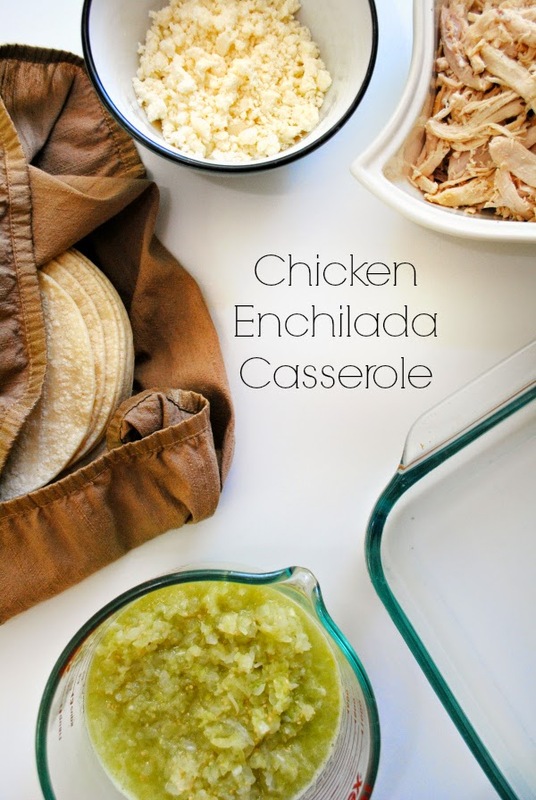 Quite simple to make and really delicious to eat -- even my husband who dislikes most Mexican food (he doesn't understand why cheese and beans go together, nor does he like spicy things) enjoys this. I guess it helps that I don't put jalapenos in even though the original recipe calls for them. Some tips: (1) buy cooked, shredded chicken from the deli section of the your local grocery store. 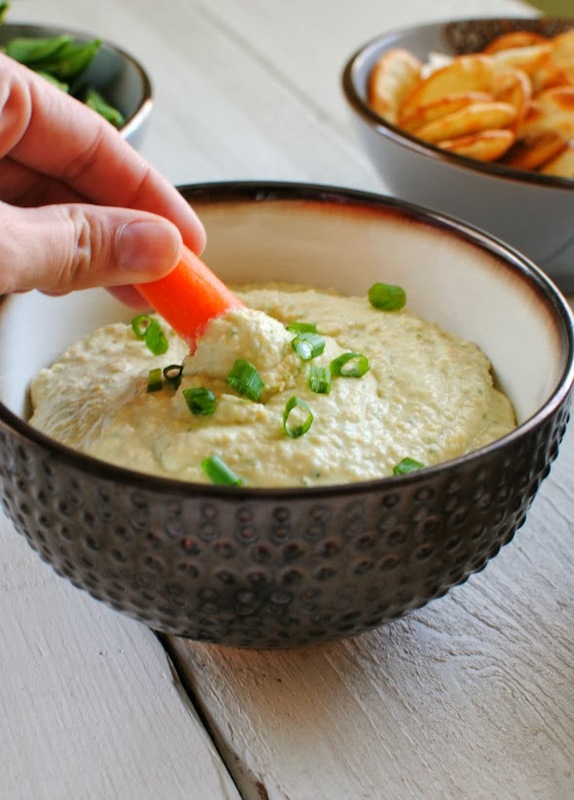 It is easier than buying it and making it yourself, and costs about the same; (2) substitute Greek yogurt in place of sour cream -- it is tangy and has the same consistency, and is a little bit healthier; and (3) start cheering on your team in the World Cup! Like I said earlier, go Team, go!!! Preheat oven to 400 degrees. In a blender, puree tomatillos until smooth. In a large skillet, heat oil over medium-high. Add onion and cook until softened, 8 minutes. Add garlic and cook until fragrant, 30 seconds. 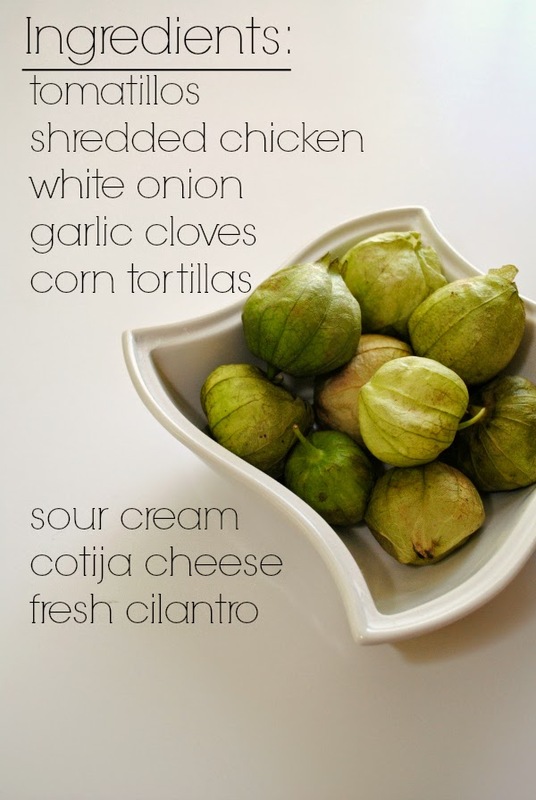 Add tomatillo puree and bring to a boil. Reduce heat and simmer until sauce is thickened slightly, 10 minutes. Season with salt and pepper. Briefly run stack of tortillas under cold water, turning to lightly dampen. 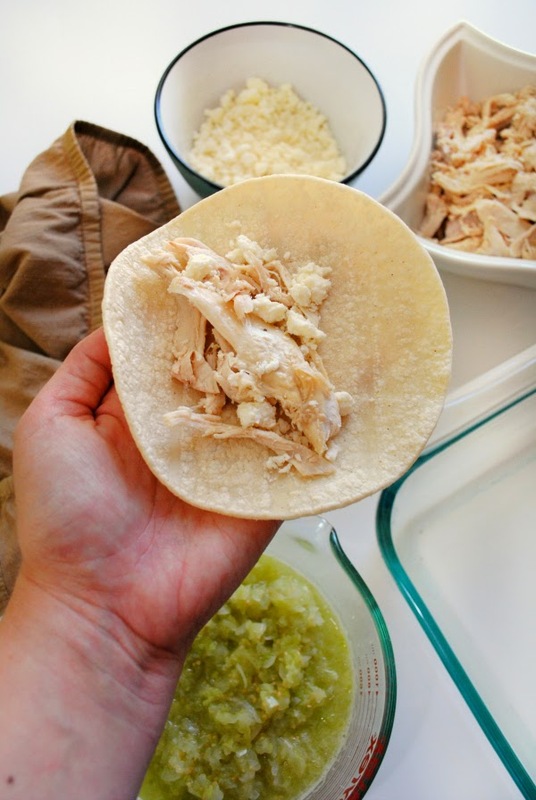 Wrap stack in a clean kitchen towel and microwave until pliable, 30 seconds. 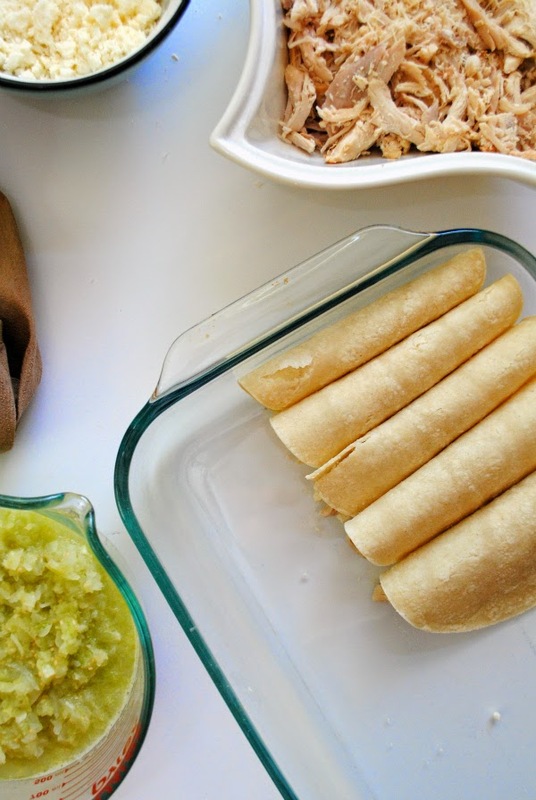 Fill each tortilla with about 3 tablespoons chicken and a sprinkling of cheese, fold in half, and arrange in a 9-by-13-inch baking dish, overlapping slightly. Top with tomatillo mixture, cover with foil, and bake until bubbling, 20 to 25 minutes. Let cool 5 minutes before serving. In a small bowl, whisk together sour cream and 2 tablespoons water. 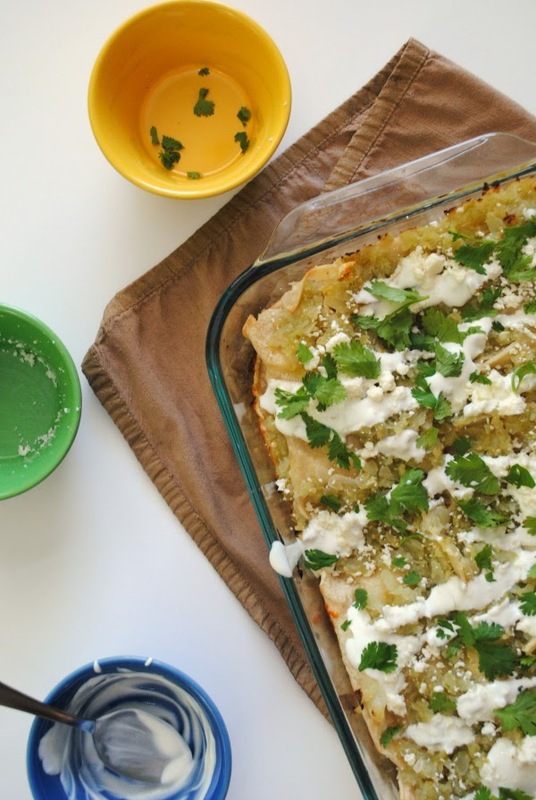 To serve, drizzle casserole with sour cream mixture and sprinkle with cheese and cilantro. 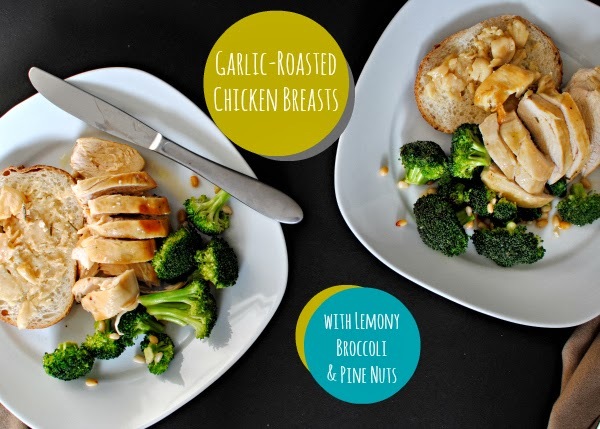 Garlic-Roasted Chicken Breasts + Happy New Year! Um, what? When did we go through a whole 'nother year??? And two-thousand fourteen... doesn't that just seem so far in the future? Not like it is the end of today's date... yet it is. Weren't we just all stocking up on extra supplies just in case the Y2K bug destroyed life as we knew it? However we got here, Happy New Year! I am glad we all made it through another year -- and hopefully thrived. 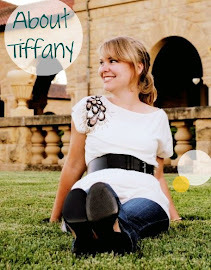 You may have noticed blog posts dwindling over time... it was not because I didn't care to keep up with it. Rather, it was because I was juggling many balls at a time, and sometimes you just have to let a ball drop here or there. It happens. But I miss blogging. My hope is that I will be able to pick that ball up more, but if it means another ball must drop, I cannot let that happen. We shall what this year has in store! I hope you are looking forward to wonderful things ahead of you, and that you were able to leave 2013 behind with a smile. Here's to new adventures waiting for us... CHEERS! Preheat oven to 400 degrees. Slice the tops from garlic heads, reserving the bottoms; arrange the tops, cut sides down, in the center of an 11-by-17-inch roasting pan. Place 1 sprig of the rosemary over each garlic top, and arrange the chicken breasts over the garlic. Place the reserved garlic bottoms, cut sides up, next to the chicken in the pan. Drizzle the chicken and garlic bottoms with the olive oil. 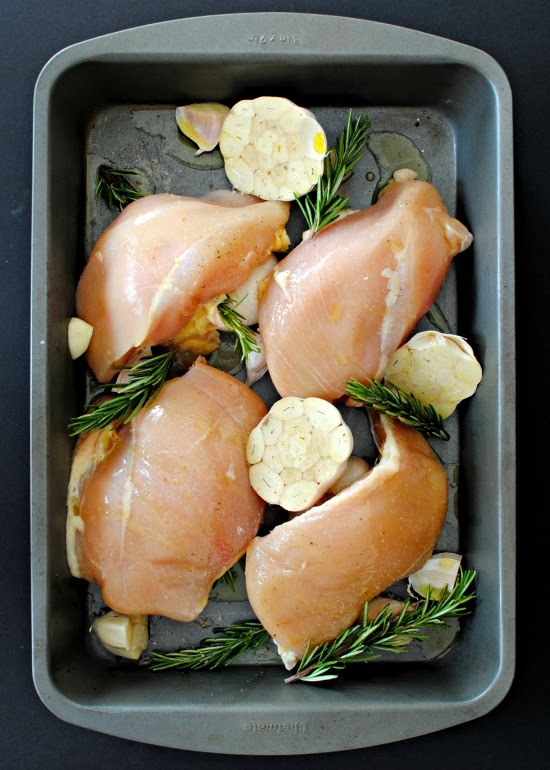 Season the chicken with salt and pepper; place the remaining 4 sprigs of rosemary on top. Roast the chicken for 30 minutes; turn the garlic bottoms cut sides down, and rotate the pan. Continue roasting the chicken until the skin is browned, the juices run clear, and an instant-read thermometer inserted into the thickest part of the meat registers 165 degrees, about 30 minutes more. While chicken is roasting, prepare broccoli: heat a large skillet over medium-high heat and add 1-2 tablespoons olive oil. 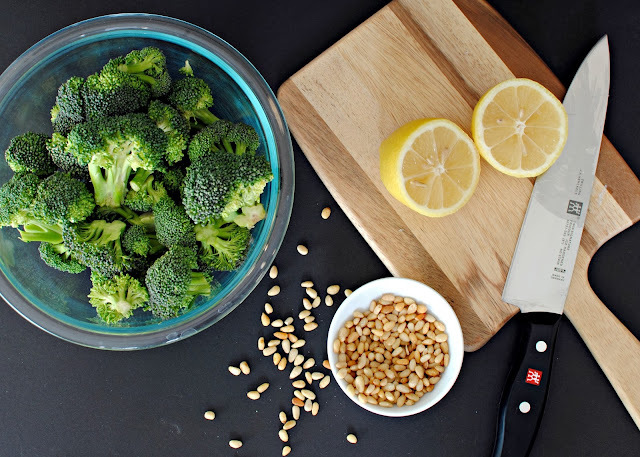 Add broccoli and pin nuts. Squeeze juice from lemon. Add salt. Cook until tender and remove from heat. Pour the pan juices into a measuring cup; skim the fat from the top. 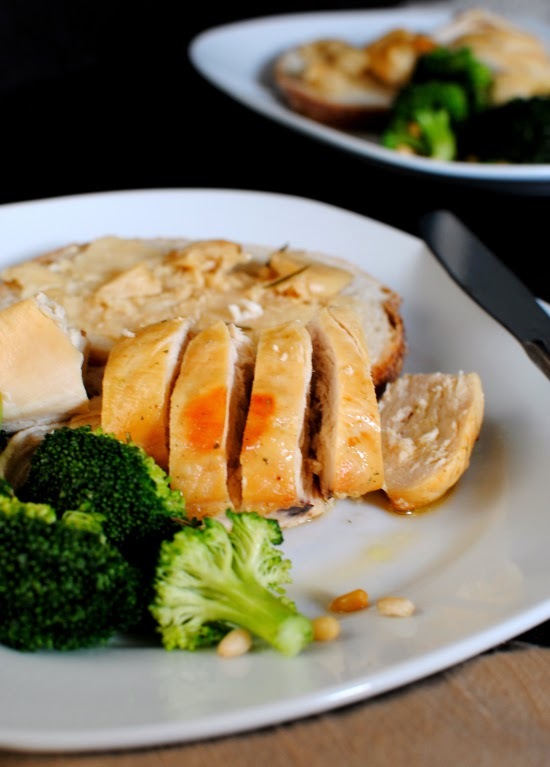 Serve the juices with chicken and roasted garlic. 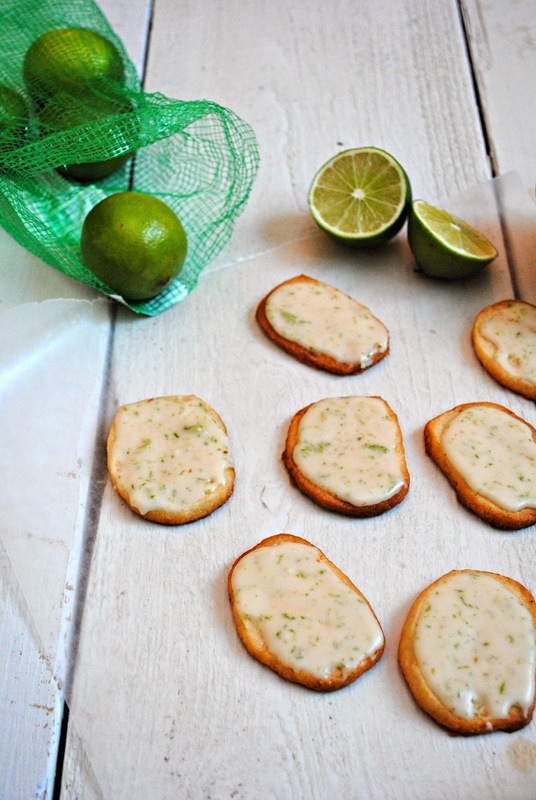 The roasted garlic makes an excellent topping for toast. 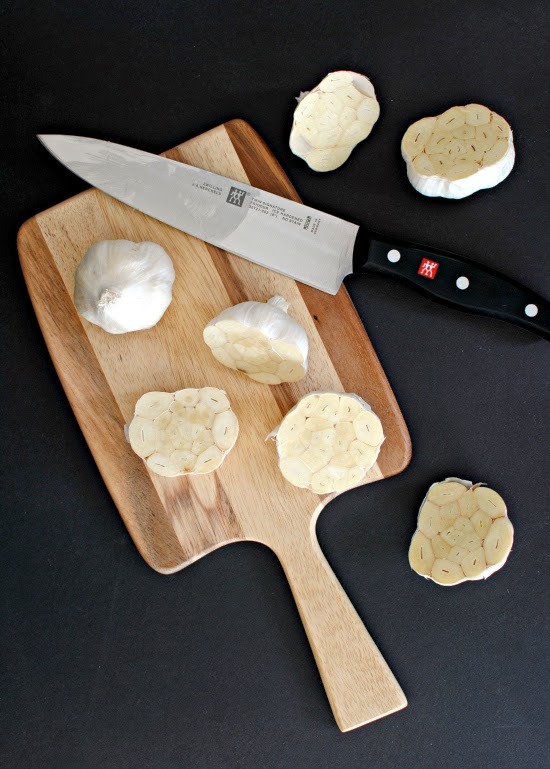 Just squeeze cooked garlic cloves out of paper skin and use a fork to mash on top of sourdough or other rustic bread. Sprinkle lightly with salt. Our neighborhood is pretty awesome. It is December 22 and there are people out BBQing together. The other day one neighbor came over with a plate of cookies and a chat by the Christmas tree. The next day another neighbor called to ask if we needed some extra lights as they had leftovers. And last night we all got together to do a Progressive Party up and down the block. Yup, we are pretty rockin'. I know there are many neighborhoods like this -- I grew up in one -- but it seems to be less and less common. At least in my adult years. People are busy, schedules are full, lives are different from one house to the next. But I am grateful that today I get to be a part of a place that celebrates community. My contribution during the stop at our house? 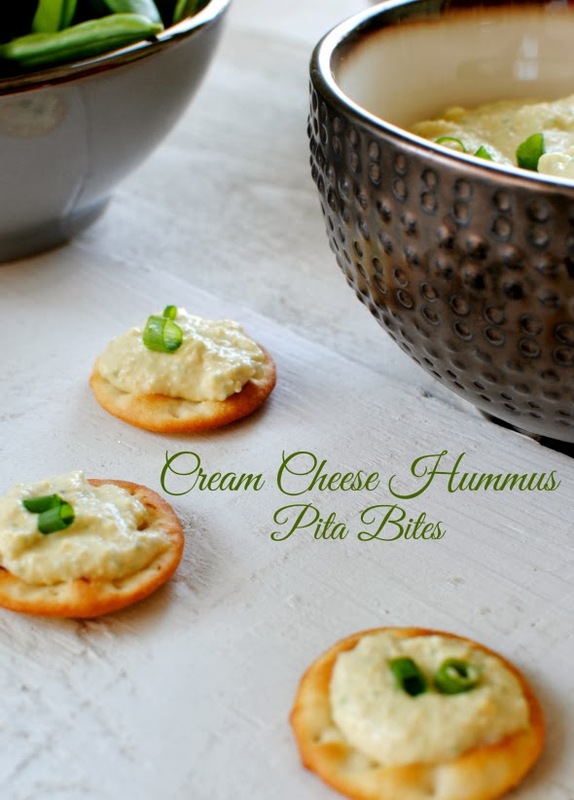 Sparkling cider and this: cream cheese hummus. Everyone else ooh'ed and ahh'ed, and I smiled because I know it took me five minutes. I mean, really, do I have time during the holiday season to make something time consuming? No, I do not. Which is why this is perfect. 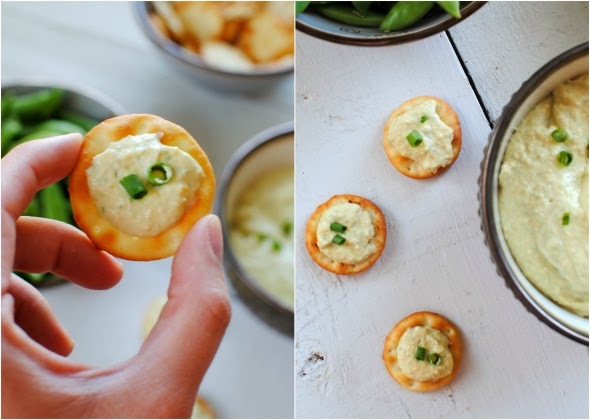 Perfectly simple, perfectly delicious. And will go perfectly with our Christmas dinner in a few days... one less thing I have to stress over. That's a holiday win. In a blender or food processor, blend all ingredients together until smooth. 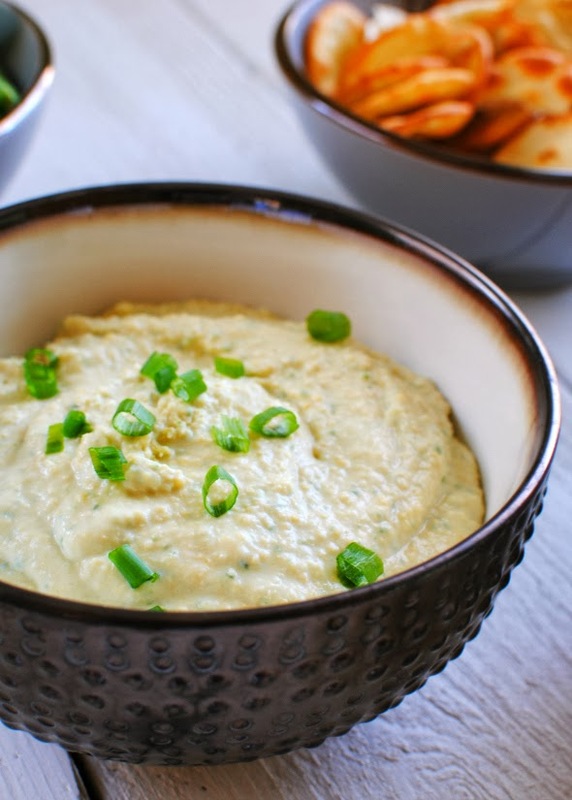 Either spread on pita crackers and top with green onion garnish, or serve as dip. I am a lover of peppermint. Not just at Christmas time, either. It isn't unusual to hear me order a peppermint hot chocolate at Startbucks in July. And they comply, albeit with a slight shake of the head. I know -- I am breaking the peppermint rule: it is a Christmas treat, and that's that. But who says so? Not me. 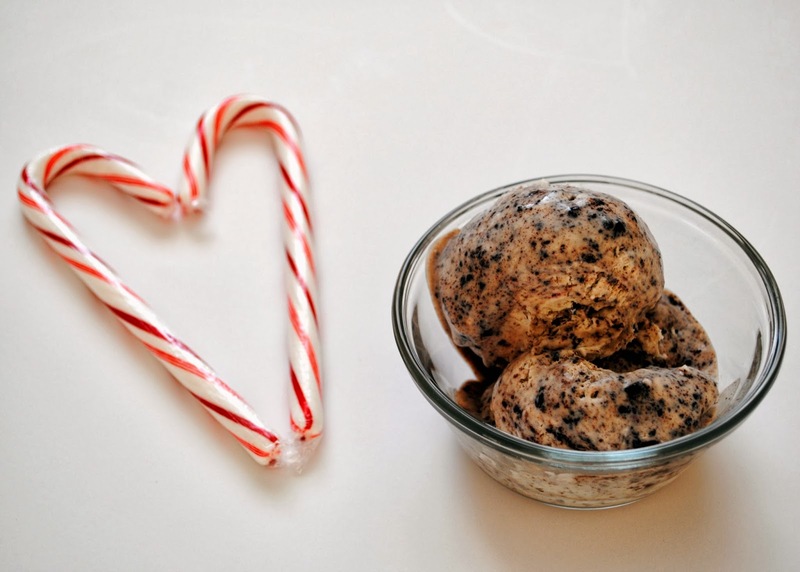 I say give me peppermint all year long, and I will show you a happy girl. My favorite peppermint thing? Peppermint Joe-Joe's from Trader Joe's. Crazy goodness, right there. Like an Oreo (but better!) 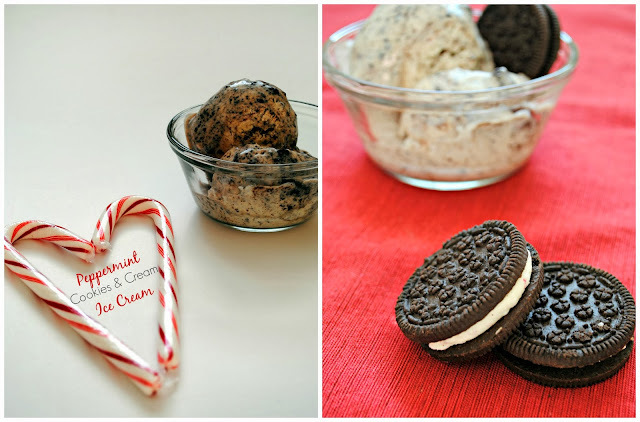 with real pieces of candy cane crushed into the cream. Um, HELLO. Could they have created anything better? No, definitely not. I took my favorite cookie (which we stock up on around Christmas so they can last until about April when they expire -- smart, right?!) and turned it into my favorite type of dessert: ICE CREAM. Best part is that you don't even need an ice cream maker, just a blender or food processor, and mixer of some sort, and a freezer. SHEZAM! 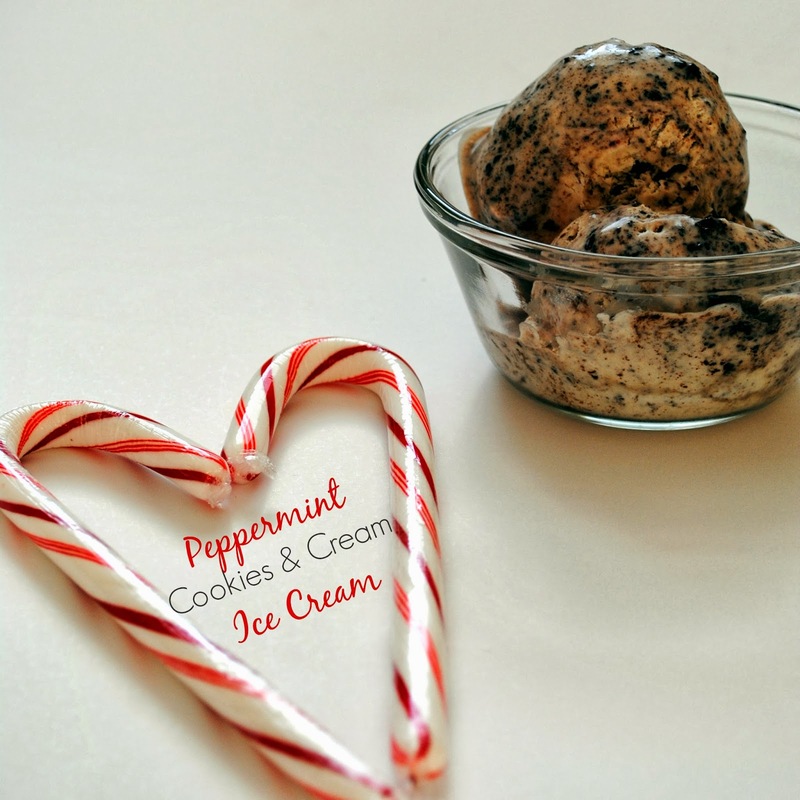 Pepperminty deliciousness in a bowl. 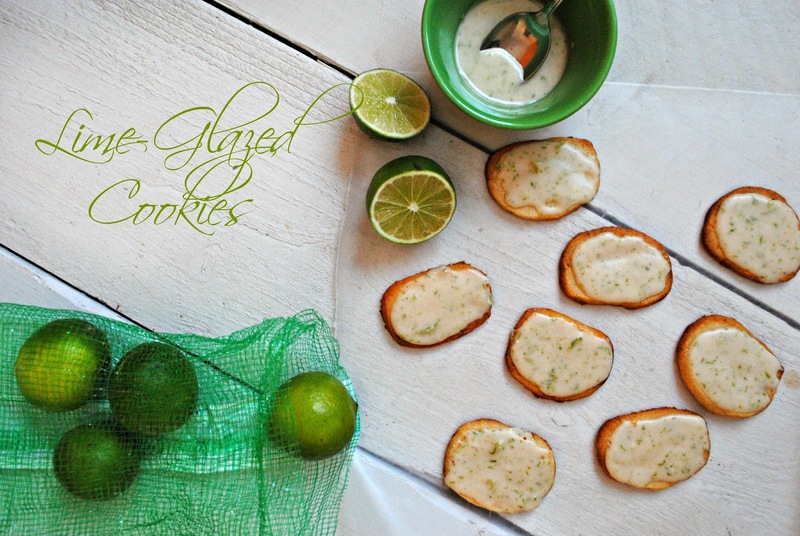 In a blender or food processor, blend sweetened condensed milk with cookies. Combine whipping cream and peppermint extract in a medium-sized mixing bowl. Beat cream/extract with a mixer on medium-high speed until whipped cream is formed. Combine sweetened condensed milk mixture with whipped cream and pour into airtight plastic container, such as a larger-sized Ziploc Smart-Snap container. Freeze eight hours or overnight. It's the most wonderful time of the year... COOKIE SWAP TIME! I know that sounds a little exaggerated, but seriously, this tradition (now three years in the making) has become one of my favorite things about the holiday season. Not only do I get to look for the best cookie recipe to add to my collection, and not only do we all get to connect with other food bloggers, but by working/baking/shipping together, we raise money for causes that are worth all that effort. That beautiful number right there (so pretty, isn't it?) is the amount that was raised for Cookies for Kids' Cancer, a non-profit that works to help fund research that can help children live a full, long, and healthy life. 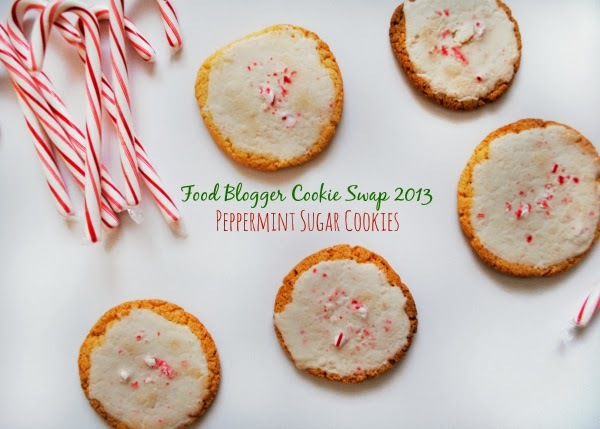 This year I chose a simple recipe, straight from Martha: Peppermint sugar cookies. 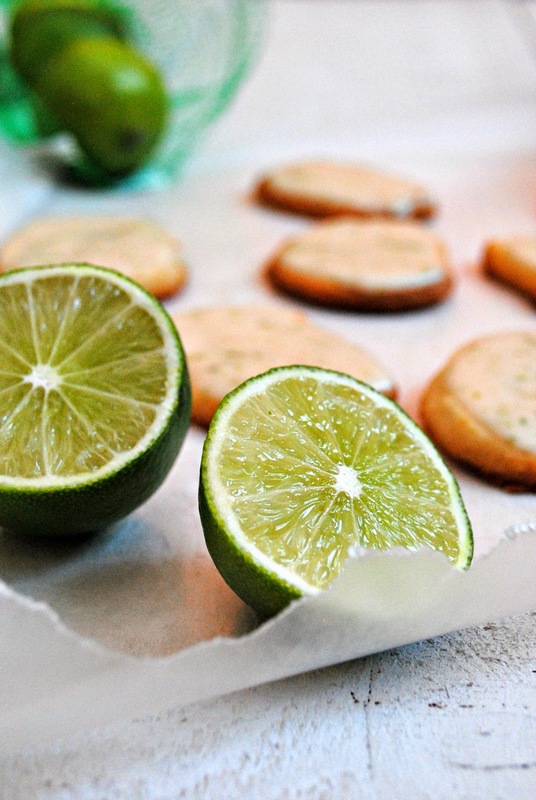 I must confess, the cookies in these pictures are the old, rejected ones. The weather was so gloomy and I kept saying I would take pictures later, later, later, and this is what I would up with. But oh! Oh oh oh. (Not to be confused with ho ho ho ;) ) I could NOT stop eating these. 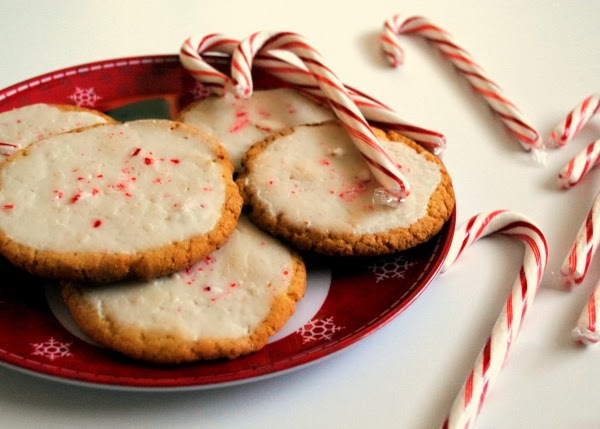 Peppermint cookie, peppermint glaze, topped with (you guessed it!) peppermint pieces! The recipe said it made two dozen so I doubled it: 1 dozen for each of my matches, 1 dozen for us... except it made about six dozen. And I did not share. Not very Christmassy of me, but if you make these you will understand why. At least I did share with my cookie recipients. In the baggies and boxes they went, off to Utah, Arkansas, and another part of California, while I received three batches of delicious cookies from across the map. That is what makes this fun -- bake, raise money, and connect with people you have never met before. It's a triple win. A big shout out to the companies that sponsored the cookie swap (by giving in addition to what we bloggers donated): OXO, Pure Cane Dixie Crystals, Gold Medal Flour, and Grandma's Molasses. Their contributions stretched our dollars -- and hopefully bring us one step closer to a cure for cancer! 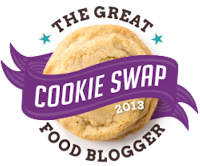 If you would like to find out about the Great Food Blogger Cookie Swap (and maybe participate next year! ), click on their logo below. Preheat oven to 350 degrees, with racks in upper and lower thirds. Combine flour, baking powder, and salt. In a large bowl, use mixer to beat butter, granulated sugar, and ¼ teaspoon peppermint extract on medium-high until pale and fluffy (about 3 minutes). Beat in egg, then flour mixture on low. Stir in chocolate chips if you are using them. 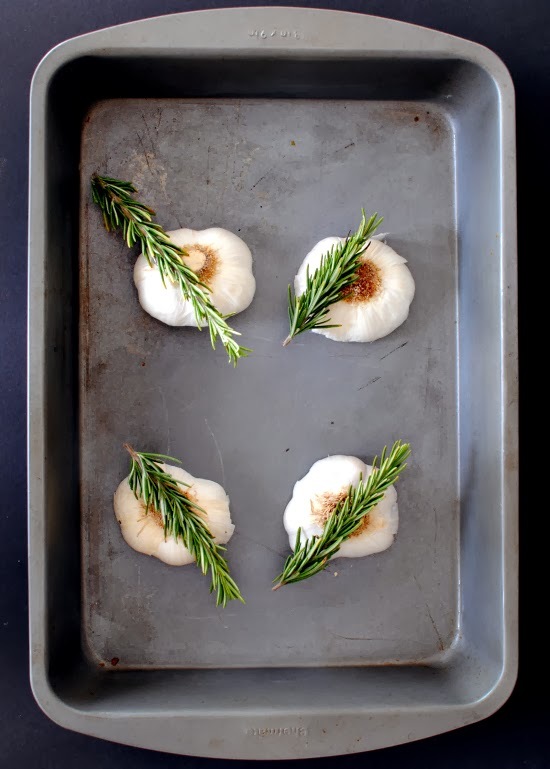 Roll dough into 1 ½-inch balls and place, 2 inches apart, on parchment-lined baking sheets. Bake until edges are lightly golden, about 12 minutes, rotating sheets halfway through. Let cool on sheets on wire racks 5 minutes, then transfer to racks and let cool completely. Stir together confectioners’ sugar and enough cream to make a spreadable glaze (if you like a strong mint flavor, stir in up to ¼ teaspoon extract). 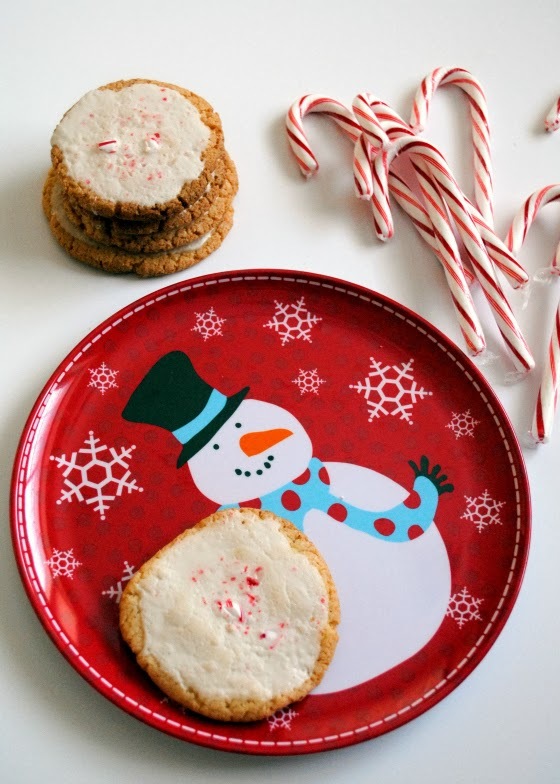 Spread a thin layer of glaze on top of each cookie and sprinkle with candies. Let dry completely on racks. Can be stored in an airtight container, three days. After a busy two weeks, I was getting ready to put something on my blog. No, not the amazing peppermint cookies I have been chowing down on (because I have yet to take pictures of them -- blame it on the minimal hours of daylight), but something to say, "Hey, I'm here! Don't forget me!" Something fun. Something cute. But then I saw this article pop up in my newsfeed on Facebook. And after reading through it, and then reading through the comments, I changed my plan. Fun and cute can wait for another day. Today we need to talk about eating healthy (yes) and the cost of it (yes). But most importantly, we need to talk about perceptions of this. I am not going to sit here and give you figures about the cost of eating a healthier diet, because you can find that information quite easily. I am also not going to share how eating more fruits and vegetables costs more money than packaged food because, at least in the USA, we all know this to be a general truth. My eyes were really opened to this when I took a master's level class on how health impacts a student's ability to learn, and how income impacts health. As you may be aware if you have followed this blog for awhile, that class combined with Jamie Oliver's Food Revolution were the main reasons I set out to learn to cook. That is why this blog is here -- because I wanted to be able to eat healthy food that I could afford and still tasted great. We get it. Eating a healthy diet is more expensive. It is unfortunate, but it is a reality. What I am going to say is this: for those many, many people who instantly commented on NPR's article saying that it costs on average $600 a month PER PERSON to eat healthy, or all those people who clearly commented without reading the article as the examples shared in the comments don't fit with what the article said at all but then rattled on reason after reason why this article is full of BS (with all caps here and there)... let's all just stop and breathe. And then, let's read the information, look at where their findings are coming from, see if we agree with it or not, and then move on with our lives. As for me, I agree. Why? Because I have been pricing out food for the past three years. 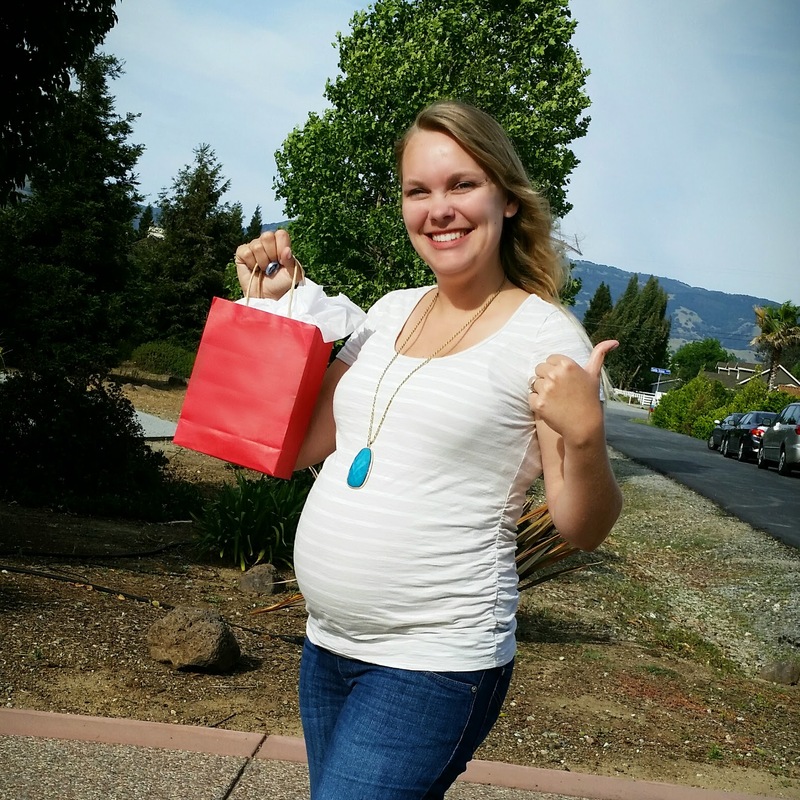 That was the whole reason I started this blog: to keep a record of what we ate, how much it cost, and then use that information to make wise decisions while planning for what we are going to eat next week. Through this, and finding out tricks like shopping at the Farmers' Market or making beans from scratch, I have learned to keep our food costs quite low. I get that there are a lot of variables in this equation, and that many things (location, time, availability of products, etc.) can change what is possible. Maybe your shopping style is different than mine. Maybe you don't enjoy cooking and you need something fast. Maybe you really just want to eat a Big Mac. Go ahead. That's OK, that's your decision. I've been there, I get it. But people, we've got to stop attacking the messenger just because we don't like the message. And please, please, please, let's stop ganging up on people (fellow commentors) because they have a different experience than us. Maybe you really do spend $600 per month for one person to eat healthy without ever going out to eat. I am sorry for you, and I hope you find ways to cut back on that. But either way, that's OK. It's your money. Maybe you really struggle to just make ends meet. I grew up in that reality, and I know a lot of people live in that daily. My heart goes out to you, for I know it is a challenge. For most of us, though, we probably fall somewhere in the middle. Let's take ownership of our decisions. Heck, when I want a McChicken, I am going to get a McChicken. 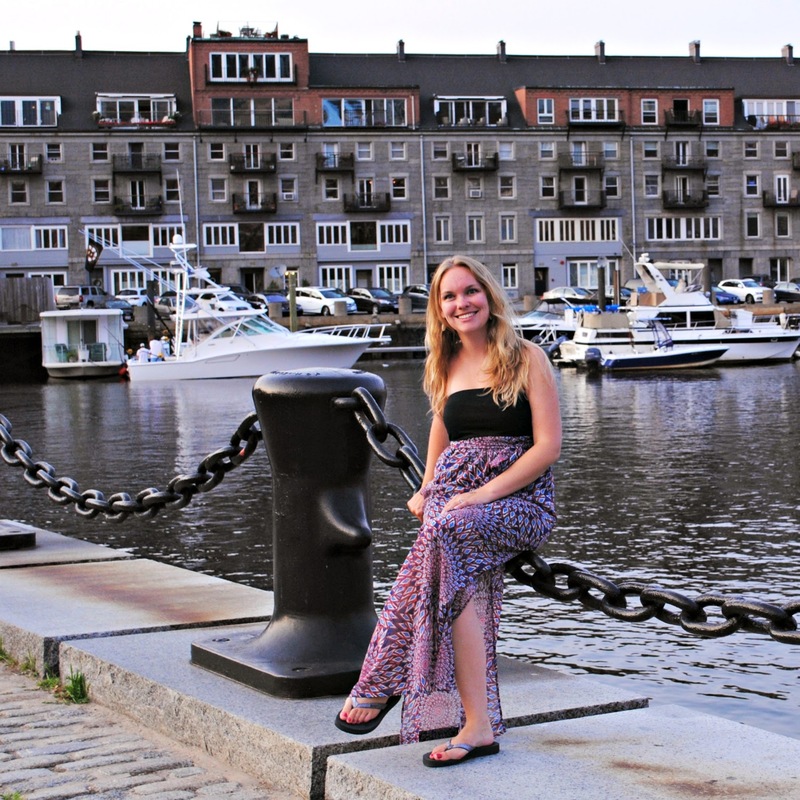 Yes, even me with a blog on finding healthy food. And that's alright. As long as I don't yell at NPR for it. 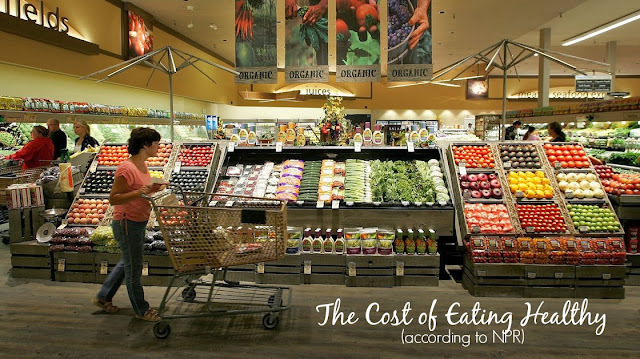 What are some ways you have found to keep the cost of food down?